Recently I noticed a package of soy-based cheese in the dairy case at my local co-op, labelled “The Good Health Alternative!” and I picked it up to scan the ingredients. I was so intrigued by what I read that I bought it just so I could transcribe the ingredient list accurately: Soy base, casein (milk protein,) canola oil, natural and cultured flavorings, organic rice flour, sodium and calcium phosphate, sea salt, citric acid, carrageenan, lactic acid, sorbic acid, potato starch added for anticaking. The taste was appalling, if you know and like real cheese. I’d eat it if I were starving- I’d eat almost anything if I were starving- but I wouldn’t call it real food. All this proves to me is that unreal food is a problem in healthy-food stores as well as supermarkets. I like 100% grassfed butter and cheese, and I order mine from the Pastureland people in Minnesota. 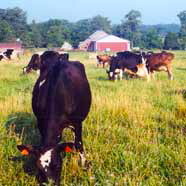 They remain grass-fed during the winter, feeding hay and forage, but they only make cheese and butter in the summer when the cows are eating pure pasture and nothing else. The taste is wonderful, the method is better for the cows, the environment, and the eater, and the ingredients list is very, very short. This is a good time of year to order because the weather is cool. They ship in styrofoam insulated cartons, and they include a prepaid UPS label so that you can ship the empty carton and gelpacks back for reuse. I order a lot of butter at a time and seal it carefully to keep in the freezer. I also buy their mild cheddar in 5lb blocks to use as my “melty” cheese and general snacking-cooking cheese. The more aged cheeses are good on the cheese platter. Naturally, it isn’t cheap. It takes a lot of good pasture to make this stuff, and good farmland is anything but free. To those who argue against having food shipped from other places, I reply that if somebody would make a product of this quality locally, I would certainly support them by buying it. But keep in mind that to maintain this quality, the cows have to be eating real grass. Not hay, not silage, but grass. If somebody in my area will start doing that, I’ll line up to buy it. Until they do, I’ll support Pastureland. This is a rare and unique product and there isn’t much like it available in the US. Regarding the CLA, omega-3 fatty acids, b-carotene, etc. that are found in grassfed butter, I would only say that I’m hard put to think of butter as a health supplement. I do think this is healthier than most butter, but moderation is still called for. The bottom line is that it tastes very, very good.